Russian President Vladimir Putin is outraged that the United States has indicted 14 FIFA soccer officials, accusing them of corruption, racketeering, fraud and conspiracy, involving bribes totaling over $150 million in kickbacks for awarding tournament rights. He says the US is meddling in Russian affairs and plotting to steal the 2018 World Cup from his country. What chutzpah. This is the same Mr. Putin who annexed Crimea and parts of Ukraine, and whose close cronies have been secretly channeling millions of dollars to US and EU environmentalist groups to oppose both American oil drilling in the Arctic and hydraulic fracturing – the game-changing process that is producing so much oil and gas that it’s slashed energy prices … and Russian revenues. Christopher Monckton of Brenchley sends this article by Grant Goldman, a popular radio host in Sydney, Australia. In July 1937 when the Marco Polo Bridge incident launched Japan’s aggression against China, that was not important enough for Australian religious leaders to write to the government demanding strong action against Japan. In March 1939 the German occupation of Czechoslovakia was not important enough for Australian religious leaders to write to the government demanding strong action against the Nazis. In November 1956 Soviet troops overrunning Hungary was not important enough for Australian religious leaders to write to the government demanding strong action against the USSR. 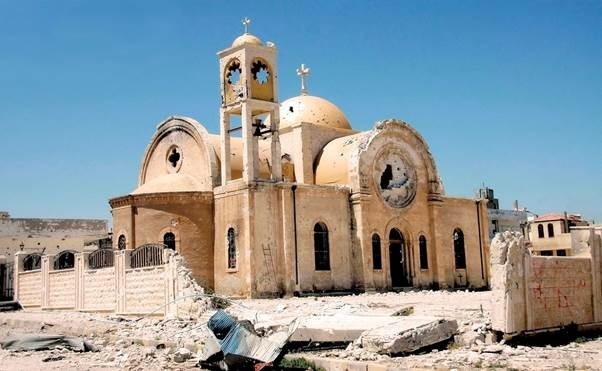 In October 2013 the massacre of Syriac Orthodox Christians and destruction of 14 churches in Sadad in Syria was not important enough for Australian religious leaders to write to the government demanding strong action against the Jihadis responsible. For folks with sensitive stomachs, I’d advise that you do not read the “Working Paper” named How Large Are Global Energy Subsidies? It was produced by the IMF [the “I” stands for “International” and most folks know what a “MF” is] as part of the media blitz in preparation for the upcoming quackathon in Paris, the 21st IPCC Climate Gabfest and Conference of the Partygoers. The Working Paper has attracted all kinds of alarmist headlines. The Guardian says “Fossil fuels subsidised by $10 million a minute, says IMF – ‘Shocking’ revelation finds $5.3 trillion subsidy estimate for 2015 is greater than the total health spending of all the world’s governments” … YIKES! One thing is clear from all of the ranting—those folks think energy subsidies are a baaaad thing. 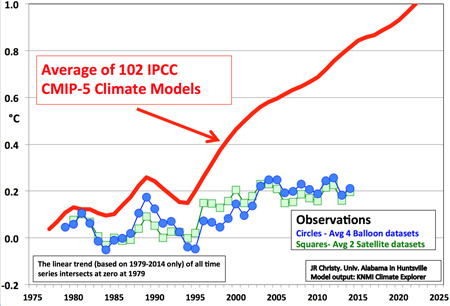 When Will Climate Scientists Say They Were Wrong? 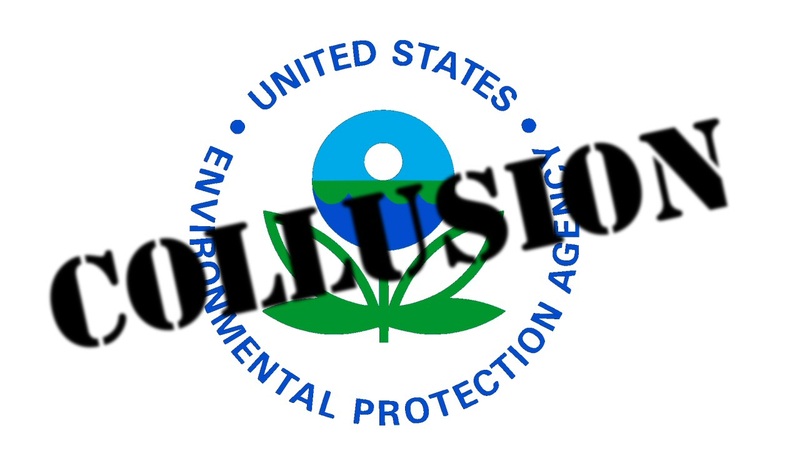 Day after day, year after year, the hole that climate scientists have buried themselves in gets deeper and deeper. The longer that they wait to admit their overheated forecasts were wrong, the more they are going to harm all of science. The story is told in a simple graph, the same one that University of Alabama’s John Christy presented to the House Committee on Natural Resources on May 15. The picture shows the remarkable disconnect between predicted global warming and the real world. The red line is the 5-year running average temperature change forecast, beginning in 1979, predicted by the UN’s latest family of climate models, many of which are the handiwork of our own federal science establishment. The forecasts are for the average temperature change in the lower atmosphere, away from the confounding effects of cities, forestry, and agriculture. In 2001, MIT’s Professor Richard Lindzen and colleagues published a controversial paper titled “Does the Earth have an Adaptive Infrared Iris?”  If there were a tropical adaptive infrared iris, then Earth’s sensitivity to GHGs would be much less than the IPCC had supposed.